Happy Wednesday, everyone! I am super excited today because my wonderful hubby figured out how to change the photo that's next to the blog's description. It was photo of me that was taken while I was working (and I look tired and not ready for a close up!) at a wedding and it was never intended to stay on the blog for more than a few days. I couldn't find a photo to give the person who designed the blog so I gave him the first one I could find and I said I would later get him the permanent photo. Fast forward 4 years and the photo was still there! Recently I started asking Art to figure out how to change it and he finally figured out all the html stuff out! It's funny how little things like this can make me happy :P I am VERY happy, though. Especially because now I get to put a photo of the two of us, which is a better fit since we both make up Nataly Lemus Photography, even though I do all the blogging. Speaking of which, there will be more changes coming soon. I want to make sure people know that we are a husband & wife team so we will be redesigning the blog, website, and even our branding. If you are one of our couples already then you know how important Art is to this photography team. He is there from the first meeting, to photographing your wedding, to the delivering of the final product. When I first started doing wedding photography it was "my thing" but that quickly changed and I am so happy it did. 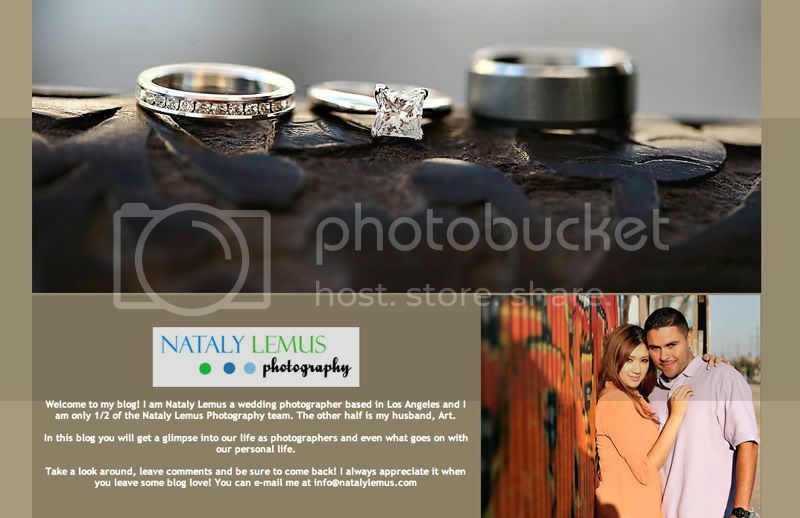 The Nataly Lemus Photography name is quite deceiving because we both work equally hard and I think it's time that I give him some credit :) So little by little you will start to see changes here and on the website. For now the changes Art made were just a few. He changed my photo, I switched the wording just a bit, and Art added a facebook link. I can't wait to make some more changes to the blog and website! Art won't be making those but for now I am very happy with what he did do :) Five stars for Mr. Lemus! How awesome!!! I know you mentioning making this transition a while back and I think its wonderful!!!! Mike and I LOVE that picture of you guys. It's so much better than the one you used to have. You looked grumpy in the other one - totally not like how you are in real life. Love the new pic, you and Art look beautiful together! !